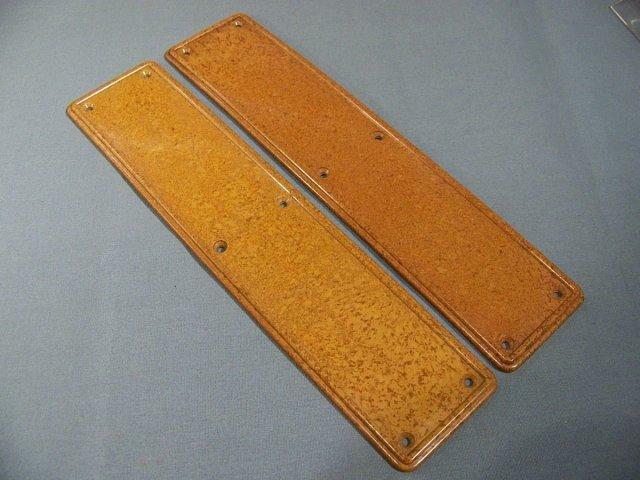 Price Is For This Pair Of Unused Old Stock, Durable Old Plastic, Or PERHAPS ,Maybe Bakelite, Push Plates, That Have A Nice, Tone; [tone of both plates is a little darker than the photo might indicate otherwise; one plate does have a little lighter tone than the other plate]. These Are Nice Plates That Might Very Well Be From The 1930's. Appx. 10 7/8" Long x Slightly Under 2 1/2" Wide. Mount By 6 Screws Into Front Of Backplate. 1 Pair Is Available. We Have Never Had Another Pair Of These Old Plates, In All These Years. Please Email Or Call Us For The Shipping Cost, Before Submitting Payment. Purchaser Pays Shipping.